3M Scotch® Filament Tape 894 is a performance-grade black UV-resistant tape reinforced with continuous glass-yarn filaments that give tape high tensile strength and low stretch. The acking gives excellent abrasion and moisture resistance, while the black color protects the adhesive from sunlight and ultraviolet rays. High tensile strength and UV resistance designed for demanding outdoors applications. Synthetic rubber resin adhesive provides good shear strength for bundling, strapping and reinforcing. 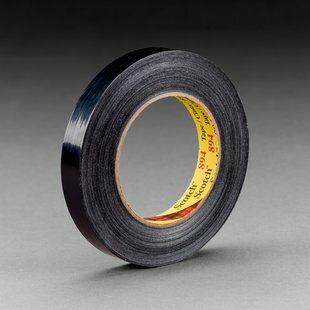 Black backing protects adhesive from sunlight and UV rays to allow for longer hold. Is great for metal working, pipe manufacturing and general industrial applications.